Rev. Jane Adams Spahr. Image from One More Lesbian. Rev. Jim Rigby, human rights activist and pastor at St. Andrew's Presbyterian Church in Austin, will be Thorne Dreyer's guest on Rag Radio, Friday, Feb. 25, 2011, 2-3 p.m. (CST), on KOOP 91.7 FM in Austin. To stream Rag Radio live on the internet, go here. 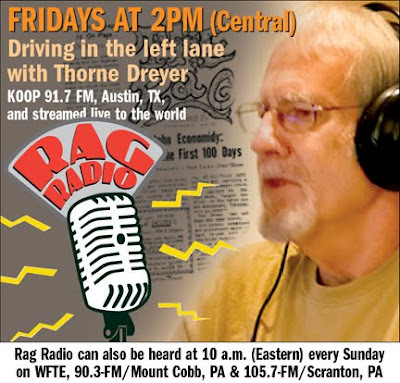 To listen to this interview after it is broadcast -- and to other shows on the Rag Radio archives -- go here. A recent Los Angeles Times profile of Rev. Jane Adams Spahr wonderfully captured the loving spirit of one of my few heroes in the Presbyterian Church. This courageous lesbian minister has fought prejudice and fear within our denomination, refusing to surrender to voices of intolerance within the church. The article also captured the sense of helplessness which threatens to unravel not only the Presbyterian system of democratic government, but, possibly, our nation’s as well. But then several of [the tribunal] members apologized to Spahr, and their decision admonished not the faithful minister but the faith itself. “We call upon the church to reexamine our own fear and ignorance that continues to reject the inclusiveness of the Gospel of Jesus Christ,” panel members wrote while finding Spahr guilty in Napa last August. “We as a church need to be able to respond to... reality as Dr. Jane Spahr has done with faithfulness and compassion." In other words, the liberal members of the church court agreed with Rev. Spahr’s theology and practice but found her guilty anyway, apparently unable to step out of a system they themselves described as unjust. Some of the committee wept as they read their verdict which reminded me of a term coined by Walt Herbert, emeritus professor of English at Southwestern University. Dr. Herbert used the term, “weeping executioners” to describe those who express concern for the oppressed, but will not leave their place in the hierarchy of that oppression. Democracy demands a rare courage and sense of personal responsibility. The Presbyterian denomination originally began as an attempt at a democratic form of church government. Some in England called the American Revolution “that Presbyterian rebellion” because that denomination inspired much of the democratic structure of American government and some of its revolutionary spirit. The Presbyterian idea of democracy was not mob rule. It emphasized personal responsibility over and against any human group. The Westminster Confession of Faith went so far as to forbid surrendering one’s conscience to any human council. The refusal to surrender responsibility applied to national as well as church governments. Needless to say, that revolutionary spark now lies buried under centuries of accumulated ash. 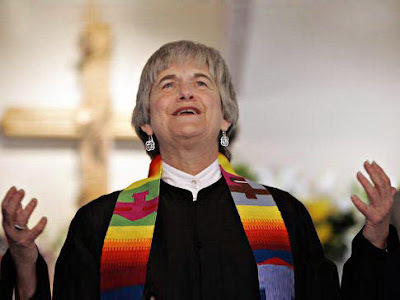 For many years, Janie Spahr has been a much needed thorn in the side of the Presbyterian Church, charging us to give every person their full human rights. Rev. Spahr was already married and ordained when she finally faced the reality that she was attracted to other women. Her husband Jimmy was fully supportive and they divorced amicably. At that point, she was an out lesbian Presbyterian pastor. Because the issue of homosexuality had not been dealt with yet, there wasn’t a provision to strip her of ordination. She was denied a position as a pastor of a church but became the “lesbian evangelist” of the Presbyterian Church, ministering to all those rejected by the church. She became gay and lesbian Presbyterians’ best hope, and homophobic Presbyterians’ worst nightmare. Once to every soul and nation, comes the moment to decide. And that choice goes by forever twixt that darkness and that light. Then it is the brave soul chooses while the coward stands aside. New occasions teach new duties. Time makes ancient good uncouth. They must upward still and onward who would keep abreast of truth. When their guilty verdict was read, some of the judicial committee wept. They agreed that the church’s discrimination against gay and lesbian persons was wrong, but because of earlier rulings by church courts, they felt they had no choice but to convict her. When those words were spoken, a muted but profound groan crept through the room. The dagger of condemnation wrapped in bandages of deedless compassion cut deeper than any words of hate. Once again, the gospel of kindness had been betrayed with a kiss. I looked around at all the beautiful people from the gay and lesbian community who had accepted me into their families. One of my lesbian friends collapsed in her chair. A gay couple embraced, staring vacuously forward, both of their shirts wet with tears. The committee seemed genuinely surprised by the response. One of the committee members confided afterward that they had given Rev. Spahr grounds for appeal “served on a platter.” That “gift” was, of course, based on the premise that someone else down the line would be braver than they. The Rev. 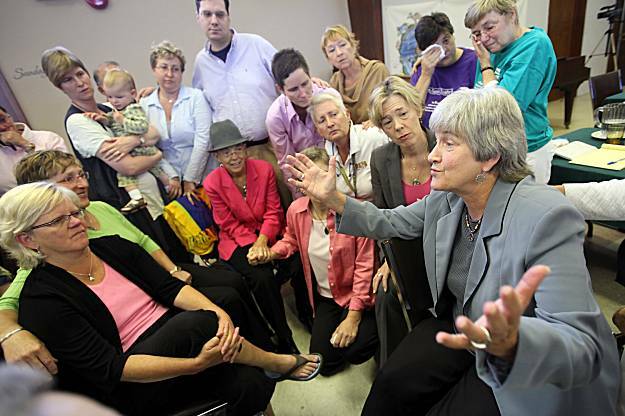 Jane Adams Spahr talks with supporters after a Presbyterian Church court handed down its ruling. Photo by Christopher Chung / AP. Most democracies are born out of revolution and begin to die on the day they choose tradition over their own revolutionary principles. Nothing is more perilous than the human tendency to grow conservative in times of great transition. Because life is change, sanity is not an unchanging state, but a commitment to change by certain standards. The revolutionary “soul” of democracy is not submission to the will of the majority, but the conviction that every human being has certain inalienable rights that cannot be put up for a vote. When a majority deprives the minority of inalienable rights, every decent citizen must be willing to leave the majority and stand with the minority. When citizens in a democracy feel their only power is to vote for candidates who then tell them what to do, they have forgotten what liberty means. They become beasts of burden who think they are free if they can vote on who rides them. Democracy demands an active courage. Unless citizens are brave enough to follow its principles in times of crisis, democracy loses its sinew and dies. Issues like immigration and gay marriage test whether our nation will follow living principles into new understandings, or perish repeating the comfortable wisdoms of the dead. I say to you, this morning, that if you have never found something so dear and precious to you that you will die for it, then you aren’t fit to live. You may be 38 years old, as I happen to be, and one day, some great opportunity stands before you and calls upon you to stand for some great principle, some great issue, some great cause. And you refuse to do it because you are afraid. Well, you may go on and live until you are 90, but you are just as dead at 38 as you would be at 90. And the cessation of breathing in your life is but the belated announcement of an earlier death of the spirit. You died when you refused to stand up for right. You died when you refused to stand up for truth. You died when you refused to stand up for justice. James Russell Lowell is still right: “Once to every soul and nation comes the moment to decide.” Issues like immigration and gay marriage force us to choose between our principles and our traditions. We will not get these moments back. If we choose tradition over our revolutionary principles, democracy will surely die. Our ship of state will be a vessel that is all anchor and no sail. Furthermore, if we do not stop surrendering our human agency to hierarchical systems of power, we are doomed to either being the sacrificial victims of that system, or of being its “weeping executioners.” Such is my denomination. Such is our beloved nation. What would it look like to step out of the system? I saw that as well. One night, during the week of the trial, the 11 couples met for an evening service. Each couple came forward to light a candle to honor the love that held their family together. Janie Spahr’s partner got up to light a candle and looked out for Janie to come join her. My eyes filled with tears as Janie’s ex-husband Jimmy got up to stand beside them to honor their love. Then his wife got up to stand beside them as well. Finally, the children of Jane and Jimmy got up to stand beside them.. When I saw that beautiful family I knew I was seeing the world that Isaiah was talking about when he said the human beings rejected by religion and by nations have become the foundation of a new humanity. Humanity’s new cathedral will be built with the shattered stones of unjust nations and unkind religions. Leaving our role in the hierarchy of oppression is really as simple as giving others every right we claim for ourselves, and ceasing to work for justice within the parameters of unjust systems. We have become like ants who built bridges out of our own bodies and now consider those bridges more real than ourselves. And it is as simple as Einstein’s charge that we should remember our humanity and forget the rest. At some point, if you will not disobey an unjust law, you are not working within the system to dismantle oppression, you are the oppression.